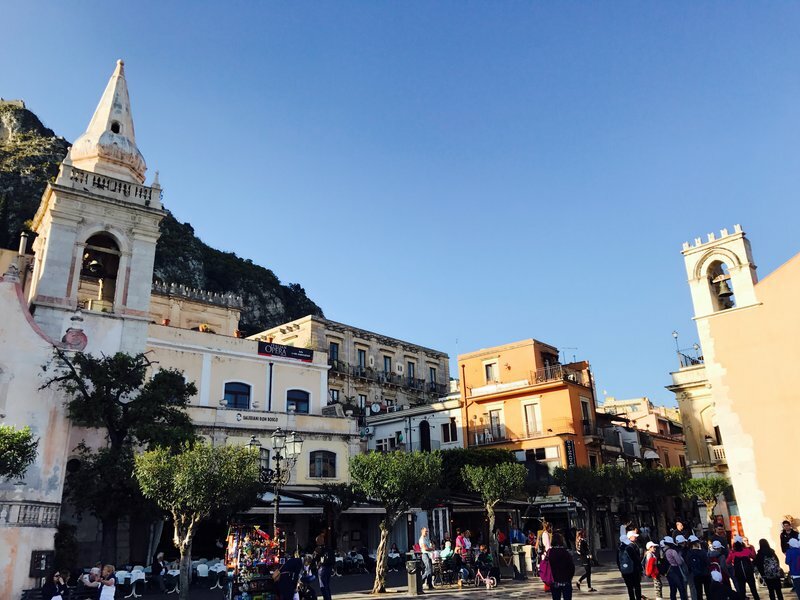 View Sicily and Malta on zzlangerhans's travel map. 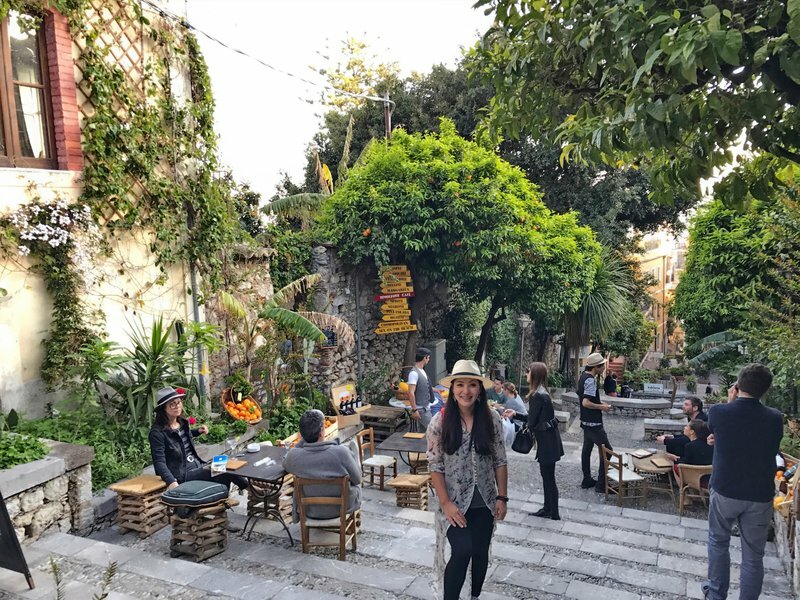 Taormina is a beautiful but disorientingly three-dimensional city. Add in the fact that the entire center of town is off limits to non-residential cars and you have a very confusing place to drive in. We were completely dependent on our GPS to get us around, and often places that seemed like they should be close turned out to be much further away than they appeared on a map. We arrived at our B&B much earlier than we had projected on our Booking.com reservation, and there was no answer at the door or at the phone number I had. Eventually I ran into the B&B owner's parents who lived a few doors down and they got in touch with him so he could help us get settled. 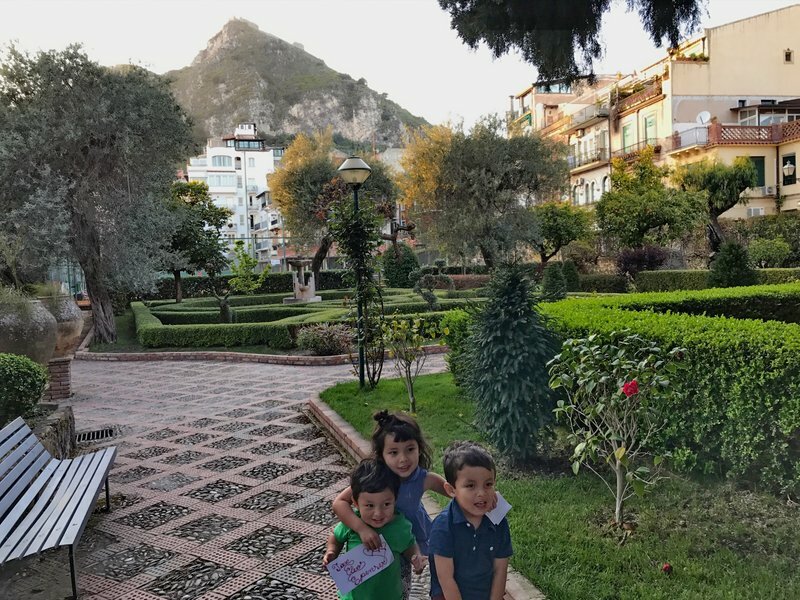 The B&B turned out to be a one-man operation with three one-bedroom apartments stacked on top of each other, and we were bringing it up from 0 to 67% occupancy. We hadn't eaten aside from snacking at the market that morning so getting lunch was a top priority. 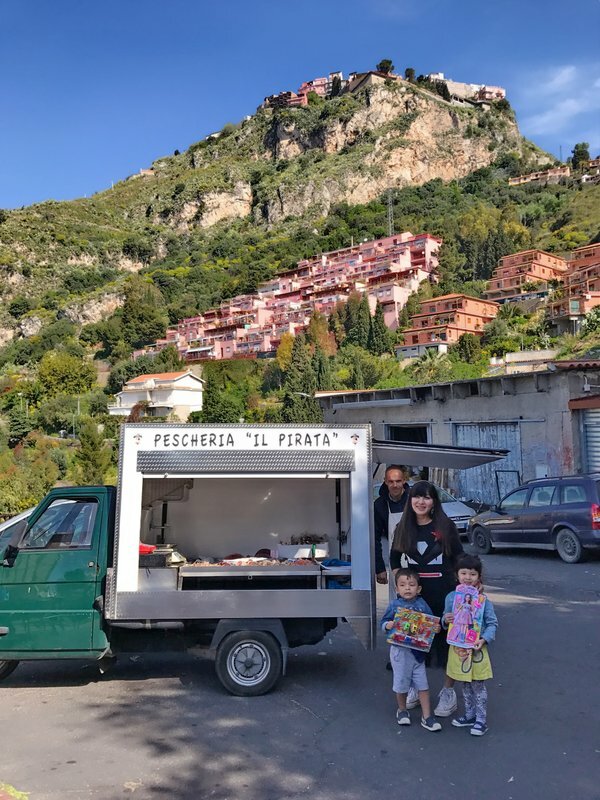 We drove up a winding road towards the top of the hill on whose side Taormina is set and eventually found ourselves at Al Saraceno. 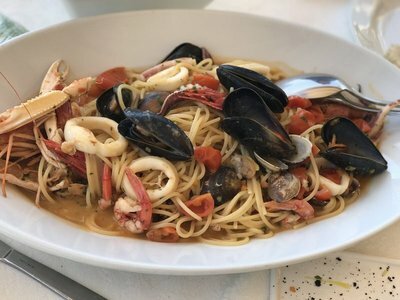 Al Saraceno was one of those rare finds, a restaurant that brings it in both atmosphere and food quality. 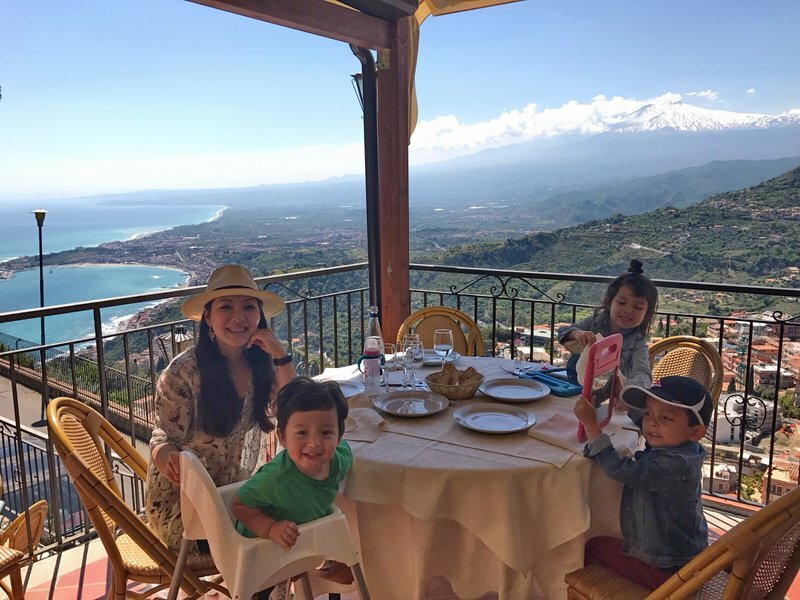 The view from the rooftop patio was breathtaking, with expansive vistas over the coastline, the hillside, and majestic snowcapped Etna reigning over it all. The lunch proved to be our best restaurant meal of the trip. 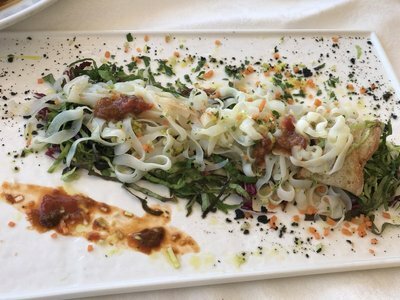 The standout dish was a salad in which squid had been cut into crunchy ribbons that resembled pasta. 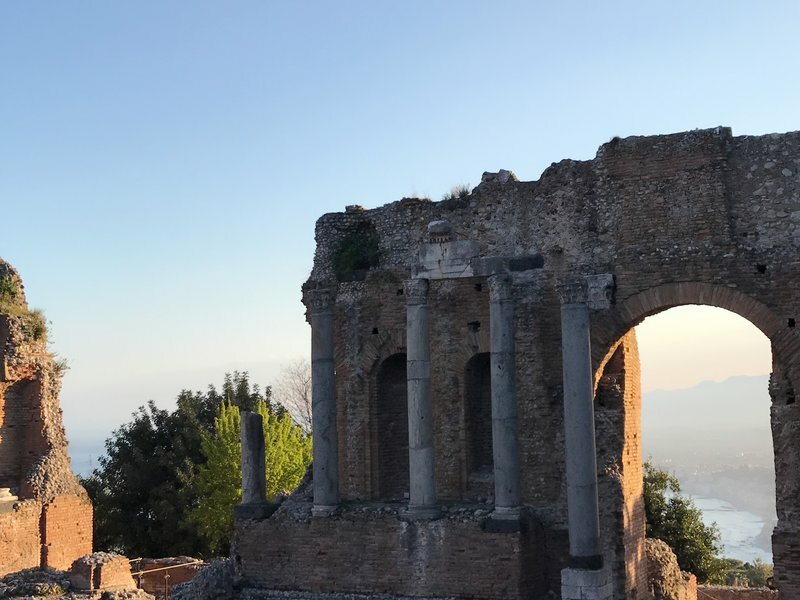 Directly above Al Saraceno are the ruins of the Castello di Taormina, which are closed to the public. At the top of the next hill over is the tiny and beautiful town of Castelmola. 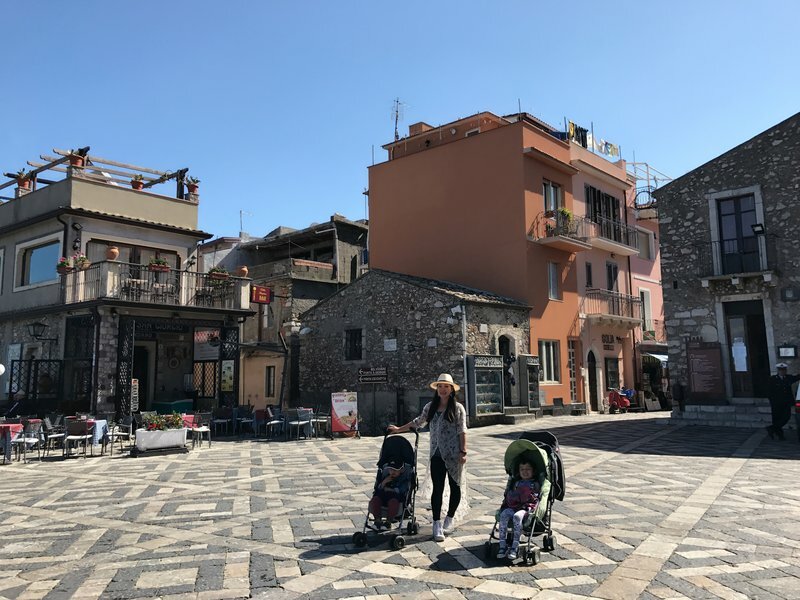 We followed the road we had just taken away from Taormina and soon arrived at Piazza Sant'Antonio, the entrance of Castelmola. 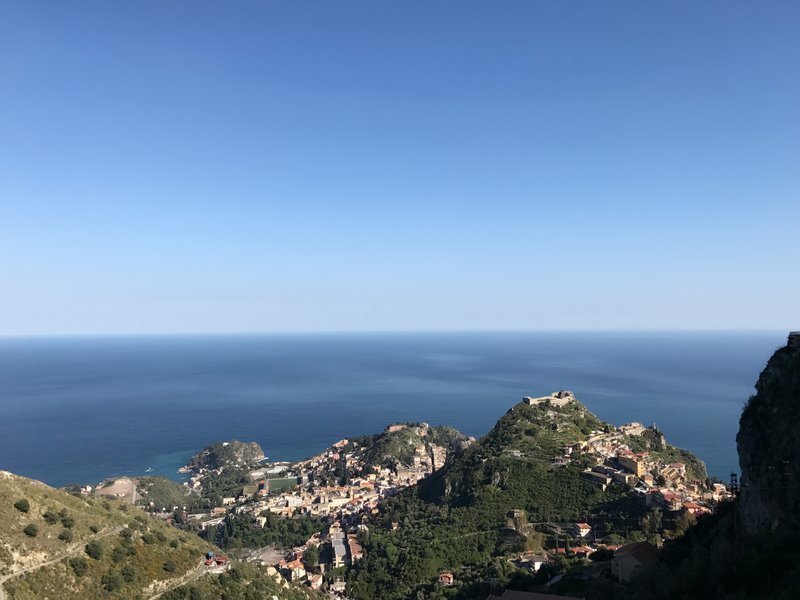 We could see the Castello di Taormina well below us atop the hill we had just left, and behind that the old town of Taormina. 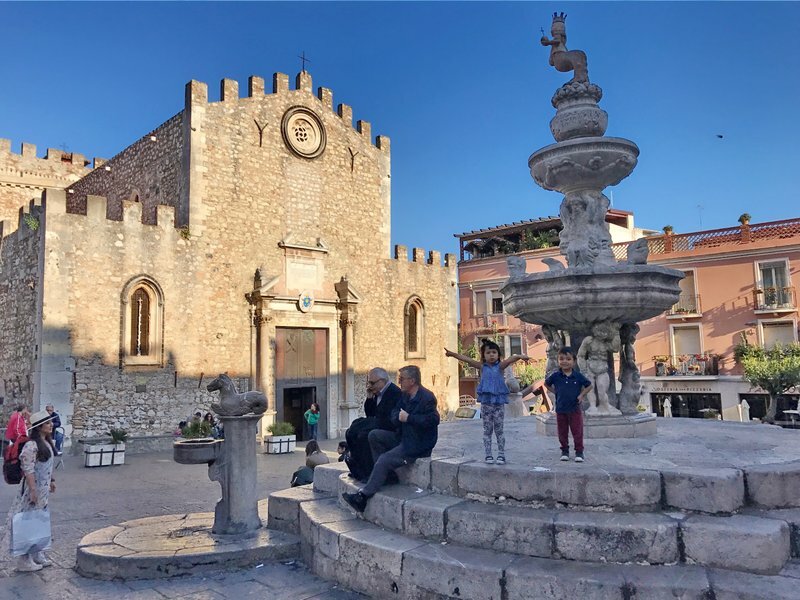 It only took about ten minutes to circle the upper part of the town and find ourselves in central Piazza Chiesa Madre. The small square was a black and white checkerboard in the shadow of the Parrocchia San Nicolo' Di Bari church. 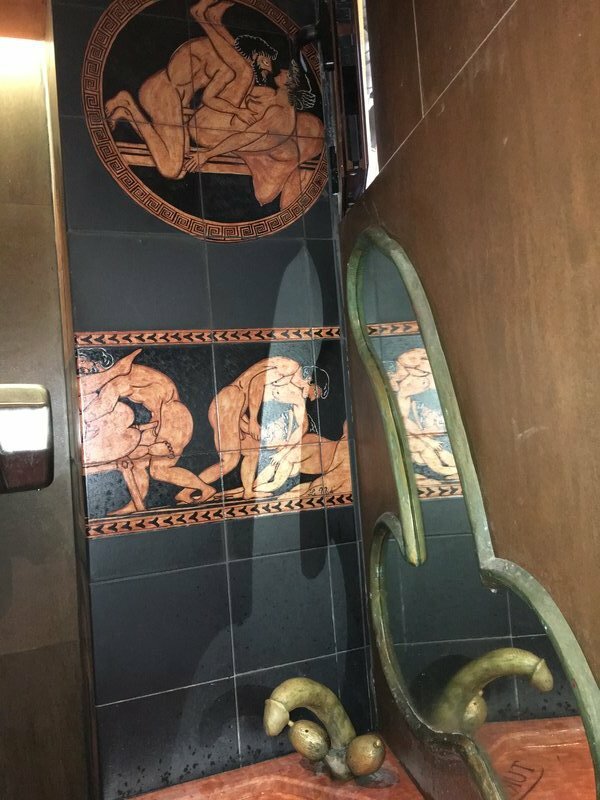 We stopped for refreshments in the famous Bar Turrisi, a five story cafe whose phallic decor thankfully went unnoticed by the kids. 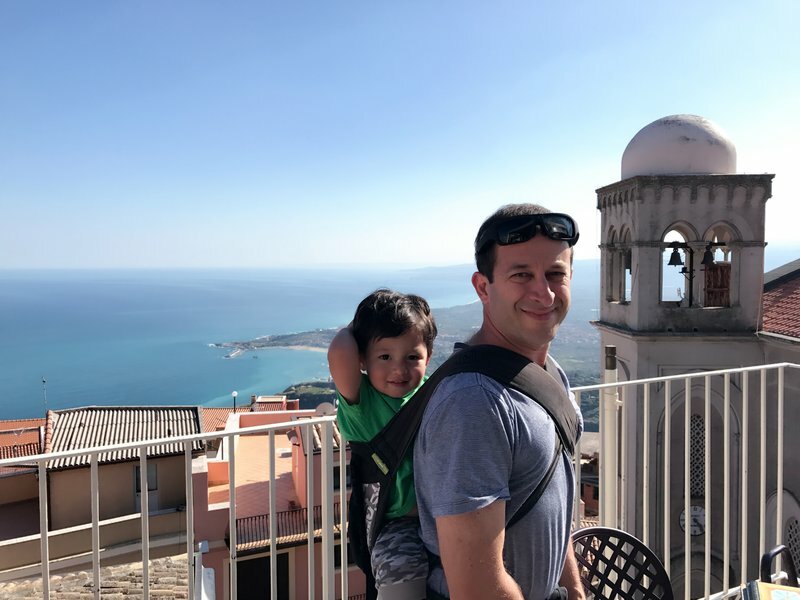 We had too much stuff with us to climb the steep staircases up to the upper floors of the cafe, but I took Spenser up to the roof for better views of the medieval town and the coastline behind it. 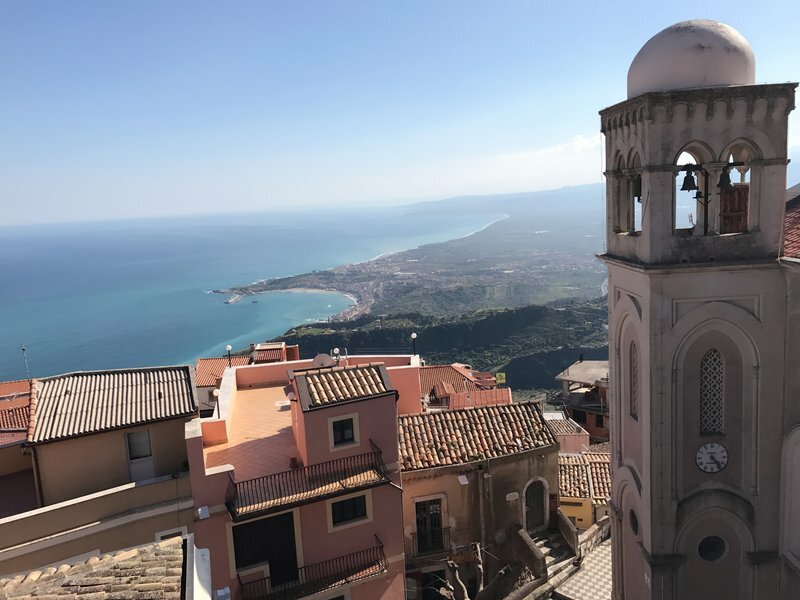 We drove back to Taormina and I made a futile attempt at street parking, then got diverted to the road out of town and nearly ended up back at the coastal highway before finding myself by pure dumb luck at the Porta Catania parking garage, where I should have parked in the first place. It's inexpensive and very convenient to the old town. 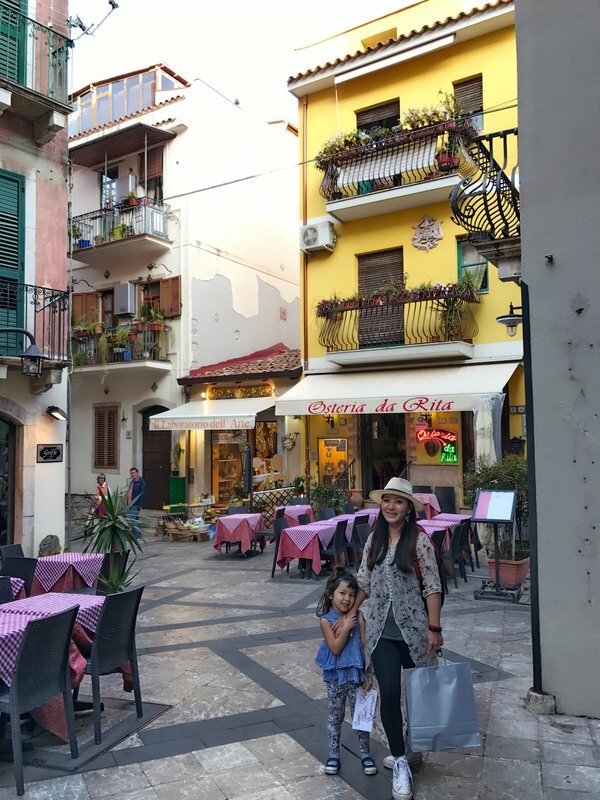 We had a very enjoyable stroll down Corso Umberto to the main square, Piazza IX Aprile. 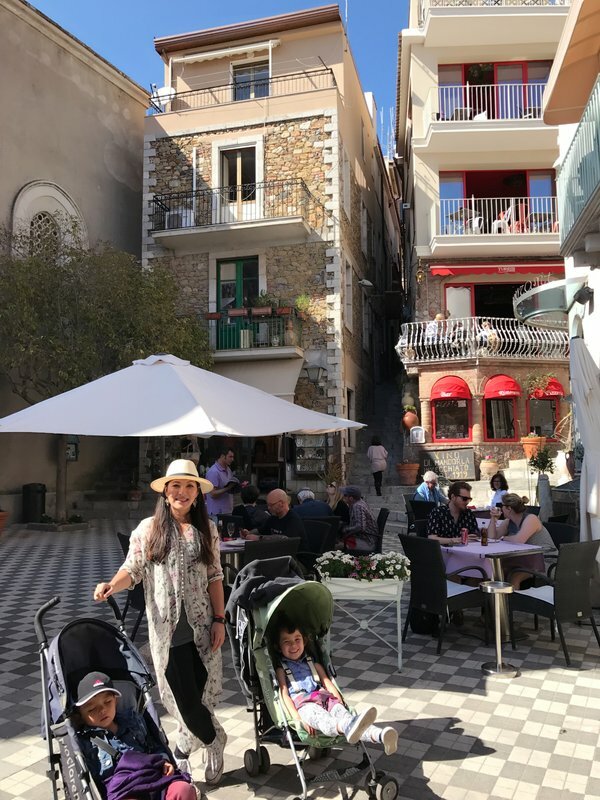 Piazza IX Aprile was definitely the center of activity in Taormina. The square was bordered by beautiful churches to the north and east, and to the south was a balcony overlooking the Mediterranean. The open square was a perfect place for street performers, and today there was a talented group of hip hop dancers in front of the Church of Saint Augustine. Once they sat down for a break, some much younger girls moved in to show off their moves and Ian couldn't resist joining them. 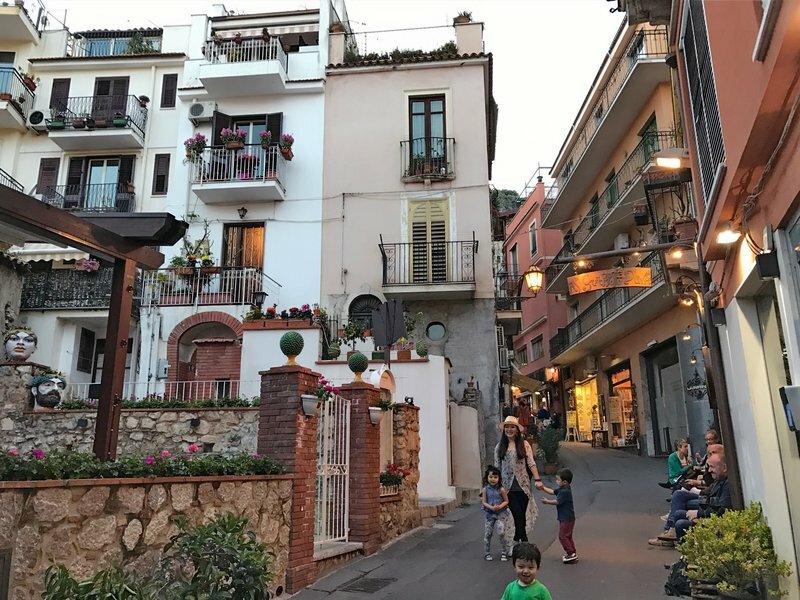 We spent another very pleasant hour exploring the western half of the old town, where the buildings spill down the hillside a little and a little network of streets joins the east-west promenade of Corso Umberto. 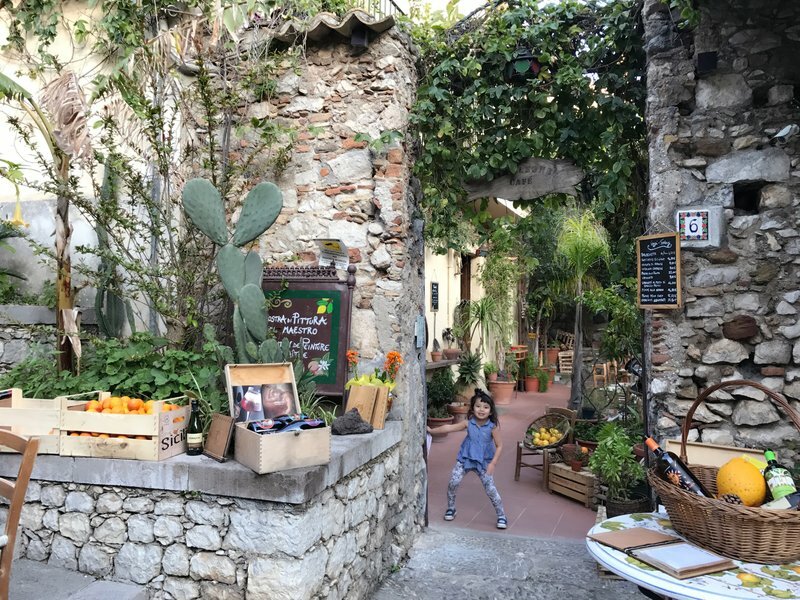 One particularly beautiful street was Via Iallia Bassia, an outdoor staircase lined with old stone walls, fruit trees, and sidewalk cafes. 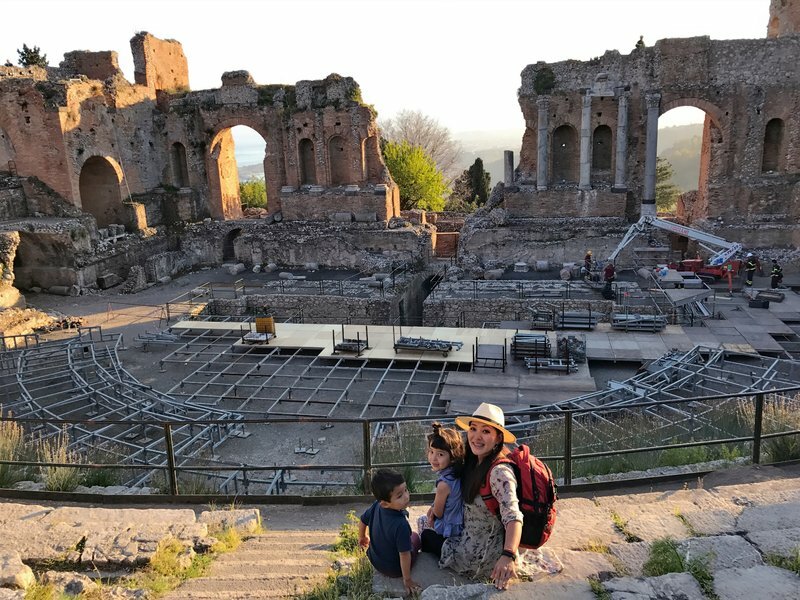 We made it to Teatro Antico di Taormina just before it closed. 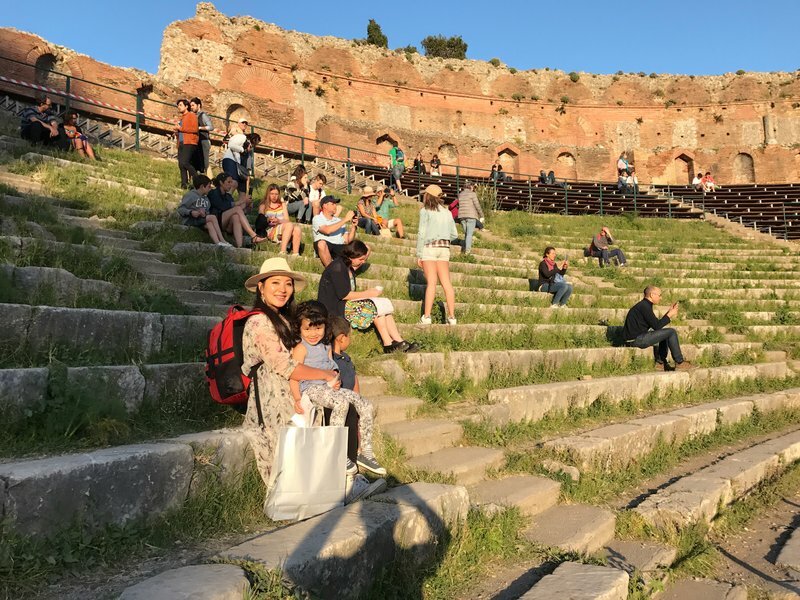 The 2300 year old Greek theater is still frequently used for performances. The gaps in the backdrop provide a natural window out to the countryside. The theater is probably one of the most photographed spots in all of Sicily. 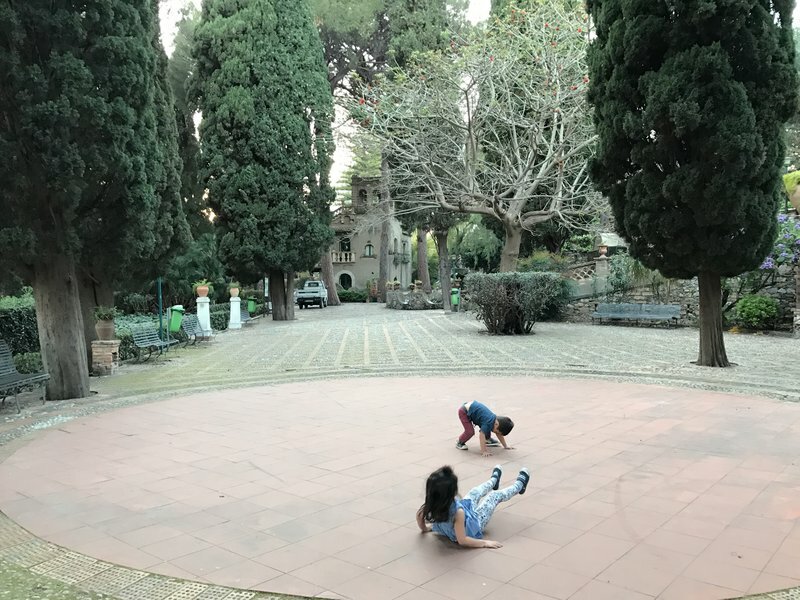 Down at the foot of the old town is the breathtaking Giardini della Villa Comunale, an amazingly large and beautiful public garden for such a small town. 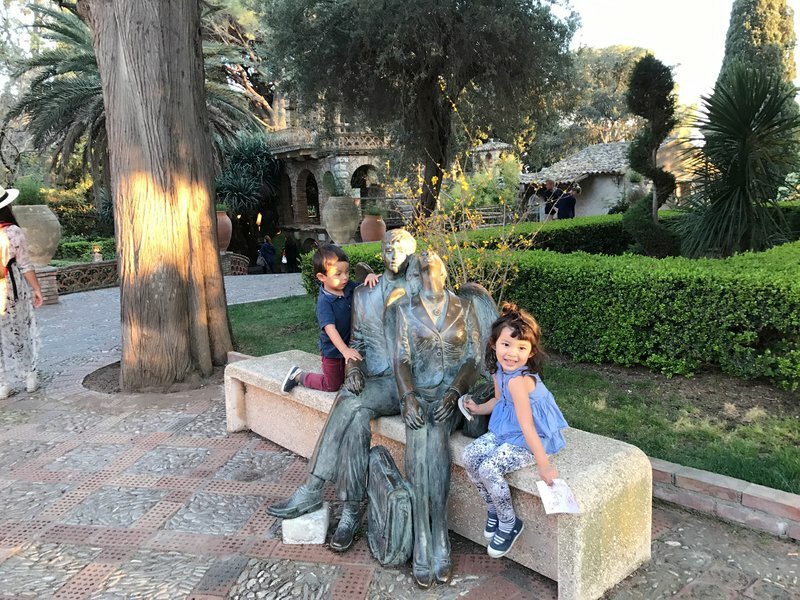 Besides the plants and pathways, the garden contains numerous statues, fountains, and quirky buildings. We walked through town one more time on the way to dinner, and then made our way back to the B&B. 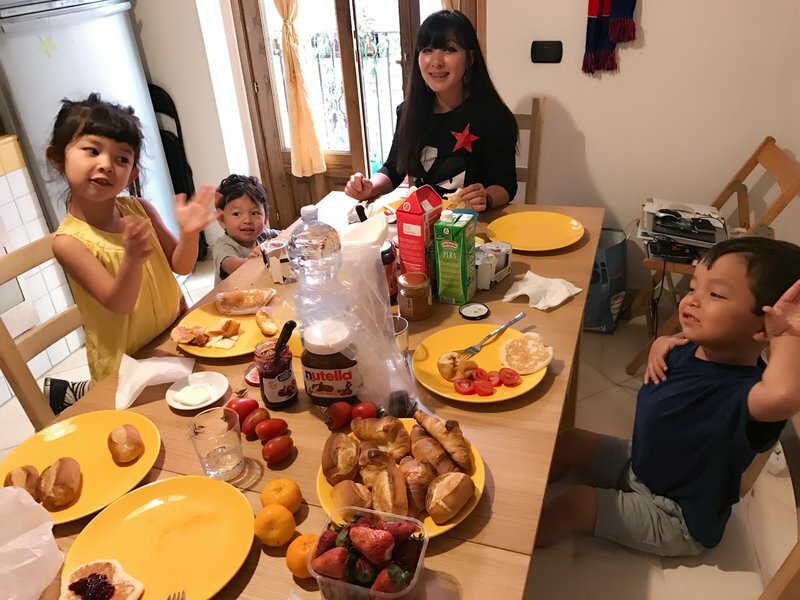 In the morning our host prepared a great pancake breakfast which we complemented with what was left of our purchases from Mercato Fera 'o Luni. 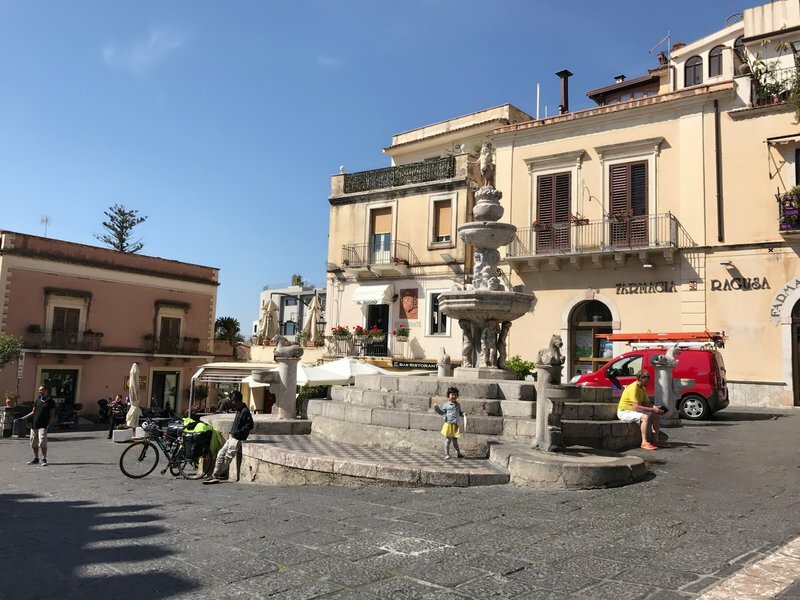 We clambered a short distance up outdoor staircases to the weekly market which was by far the weakest we had seen thus far in Sicily. We got some toys for the kids and enjoyed one last view of Castelmola directly above us. On the way back down to the parking garage we stopped to take in the atmosphere around the fountain at Piazza Duomo one last time. 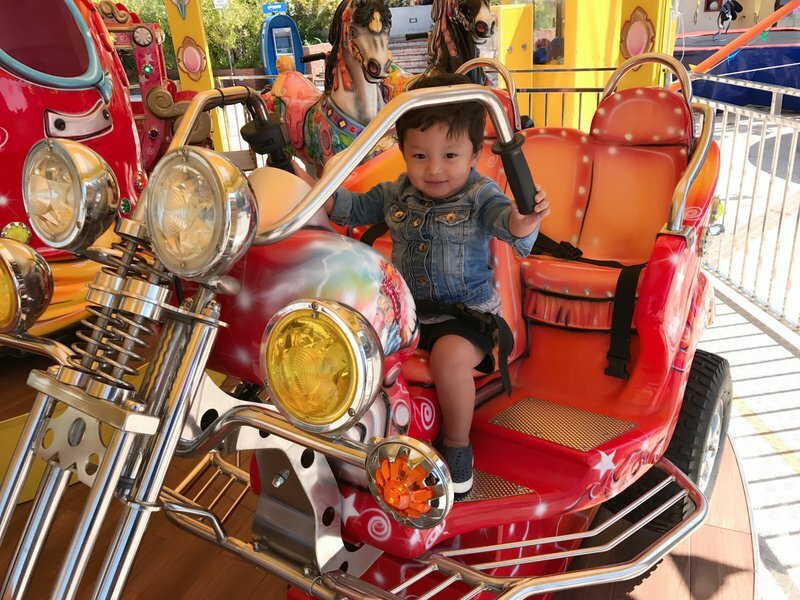 The kids got a few rides on the carousel at the garage while I retrieved our luggage from the B&B, and we were off once again. 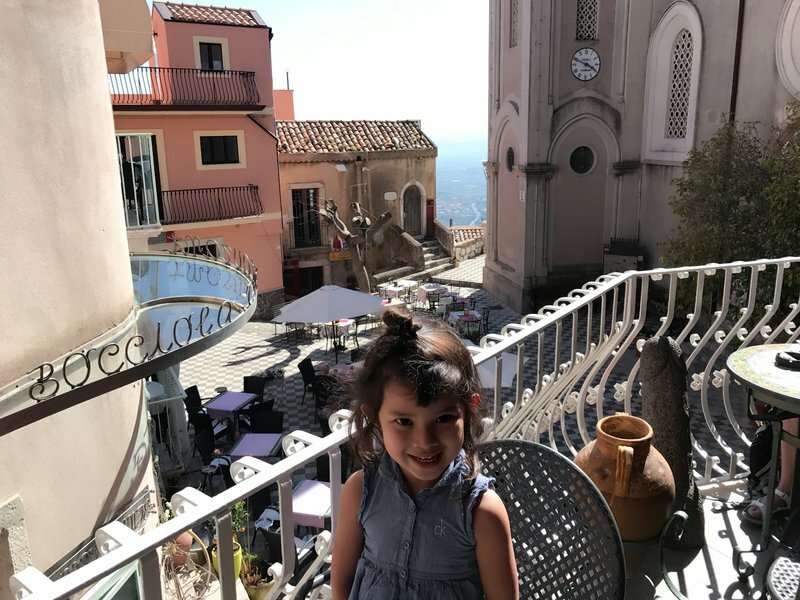 It was hard to believe how much we'd seen in less than twenty-four hours in Taormina. 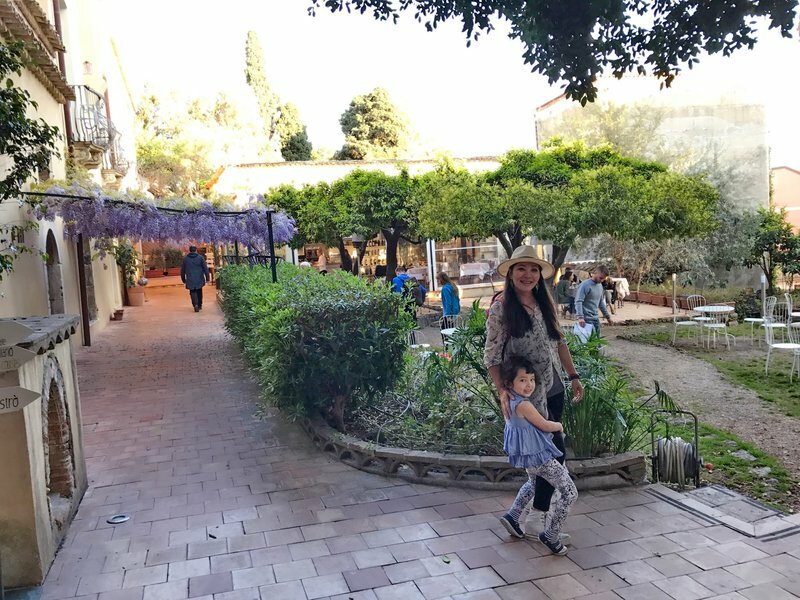 We concluded that the town deserved every bit of the heavy tourist traffic it enjoyed.